Came across the certification course on Google Analytics offered by Google Analytics Academy in Facebook and decided to take a look. The course consists of 6 different units with multiple videos within each of them followed by a final exam. Though the course is pretty well designed and covers most of the aspects of Google analytics, I watched a couple of videos randomly from the various lessons and there was not much new for me. So I decided to jump to the exam directly and Voila ! 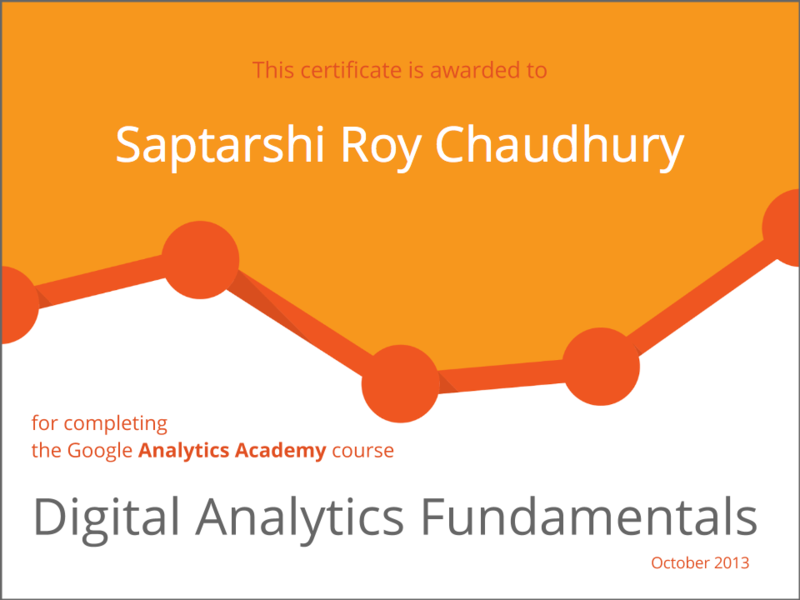 10 Minutes later I got my Certification in Digital Analytics Fundamentals from Google Analytics Academy. Not that I think this certificate means much given the ease of the exam, no entry barrier as well as the short nature of the course but then it always feels good to see a nice certificate and especially when it comes from Google.